Brand New, vintage 1960's style Fallout Shelter Sign. Unlike the original galvanized steel signs that rusted (made in the 1960s), these are made from modern 6061-T6 aircraft aluminum and vinyl. The sign design is the original that was issued by the Department of Defense. 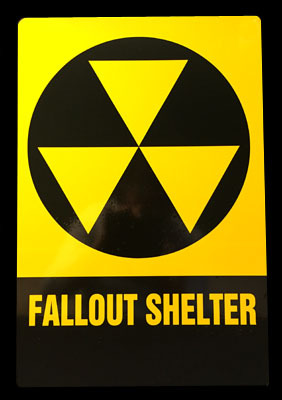 Following the Cuban Missile crisis of 1962 the President of the United States had undertaken for the nation an accelerated and strengthened civil defense program which included a fallout shelter program - placing these signs in most schools & public buildings.